Exactly like the picture with super fast delivery! I absolutely love these signs. Hauni was wonderful to work with and was quick to respond to emails. Thanks again Hauni! Finished these pretty colors late last night. Now we are off to an Easter egg hunt for some sunshine & fresh air! We just sent this sweet little monogram off to a wedding! Follow us on Instagram to see what we are up to, to see some of our new designs and for special offers! Thank you for stopping by our little shop! 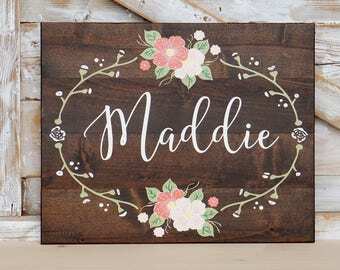 We offer unique, hand painted wood signs. We would love to make something special for your home or for someone you love. If you are not happy for whatever reason with any item you purchase, please contact us and we will gladly work with you to resolve your concerns. If we can not reach a solution I will first need to receive the purchased item returned in the condition it was sent. If you choose to keep your item a refund is not available. Unfortunately, once we have started to paint a CUSTOM order, we cannot offer a refund for a cancelled order. Shipping costs, however, will be reimbursed if the sign has not yet shipped. If for some reason your item is lost or damaged in the mail, or an incorrect mailing address is provided, we are not responsible to offer a refund or send a replacement, but please contact us as we would like to help work something out. Insurance is included on all items shipped via USPS Priority Mail or Fed Ex. We do not cover up knots, holes or imperfections in the wood as long as it does not interfere with the construction or design. We feel these perfect imperfections add to the beauty and uniqueness of each sign. Due to the variety of wood used there will be slight variations in color. Although we use the same stain and paint as pictured, each piece can "take" the stain differently. We feel that this makes each one unique and one of a kind! CANCELLING AN ORDER - this can only be done up to 5 days after purchase. Unfortunately, if you have ordered a CUSTOM sign, we will not be able to cancel your order. We accept payments through Direct Checkout through Etsy or PayPal. Work will begin on your order once payment is made. Before processing your payment, please be sure your ETSY address is correct. Your order will ship to your ETSY ADDRESS. The only way to update your shipping address is to cancel your current order, update the information on your end and then place another order. Larger signs will ship FED EX. FedEx does not deliver to PO Boxes or APO addresses. We ship our smaller packages via USPS. Your order will update with tracking information once shipped. A packing slip is included in your package and will not contain any price information. Unfortunately we cannot be responsible for packages once they leave our hands. This includes undelivered, mis delivered due to incorrect address, or packages that are damaged or destroyed in transit. Please keep in mind that all of our items will have natural defects such as knots, lines, small cracks or grain patterns. We don't try to hide those defects as we feel like it gives character to the sign and gives it the rustic look that we want for our product. Because they are made of natural wood, one sign will not look exactly the same as another. Each sign is UNIQUELY its own. It is impossible to duplicate a sign, since we aren't a mass-producer. Each sign is individually built and hand painted so it is impossible to duplicate. Also, all sign measurements are approximate - within 1". The number of wood planks used to make the item will vary depending on available wood. The stain/paint color may look lighter/darker on some pieces. All backs of signs and frames will remain unfinished. Because of the nature of our "Create Your Custom Sign" listing, we do provide a proof approval & picture with your purchase. there is a $20.00 CUSTOM FEE. Because of the time it takes to do this, this is not offered for our other listings. If you have any special requests or concerns please message us and we will be happy to work with you! Our production time is 3-4 weeks. If you need an item sooner than this, we offer a limited of Rush options per month for an additional charge. Please message us if you are interested and we will let you know what we have available. You can view your ship date at the top of your receipt. Can you send a gift note with my order? We are happy to send a gift note for you! In "note to seller" when checking out, please include that this is being sent as a gift and the words you would like on your note. Be sure the shipping address for the recipient is correct before completing check out.